New generation serial data standards with increasing speeds are continuously being introduced, causing significant signal integrity, jitter and performance test issues during the design and production of your devices. Robust performance testing is needed to ensure higher design margins and interoperability, and as a result, higher production yields. 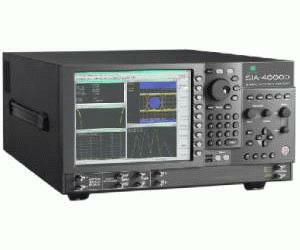 Now, with the Wavecrest SIA-4000, generate significant detail about the performance of your devices - even those exhibiting complex jitter behaviors. Perform optimized signal integrity testing on serial data applications up to 12.5 Gb/s and beyond, as well as on 15GHz clock and PLL applications. With this newest addition to the Wavecrest family of signal analysis solutions, be assured of the most accurate reproduction of your signal obtained from our unique combinition of both time domain measurements and waveform representation.